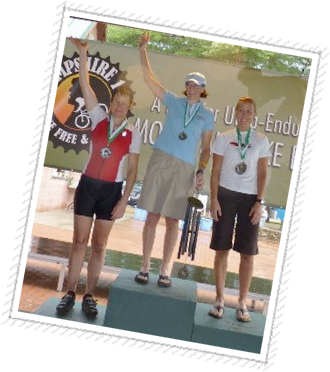 This race has been calling to me since the inaugural event back in 2007. I talk about signing up every year but for some reason or another I’ve been unable or unwilling to do it. This year I started yapping about it as usual and after listening to my indecisiveness for months Michael encouraged me to “just do it”. But before I signed up I wanted to know that I could actually handle 62 miles on the mountain bike. I haven’t had a lot of mileage under my belt this year and knew I would be in the midst of grad school and would not have much time for training. So I took a half day off from work and headed over to Mansfield Hollow with the goal of riding until I saw 50 miles on my odometer. My plan was to ride three 20 mile loops with a couple pit stops at the car to refill my water bottle. Unfortunately the loop by the transfer station was flooded so I completed 2 full laps without that section then not so creatively re-rode the lollipop and lake loops until I got the full 50 in. The last 3 or 4 miles were tough but the only body parts that really hurt were the bottom of my feet and my lower back so I decided I could ride another 12 miles on adrenalin and went home and signed up for the race. I think the lower back pain was caused by having my larger EMS camelbak with a full 100 oz bladder and decided to carry my smaller REI pack with just a mostly full 70 oz bladder during the race to avoid the back pain. For race day I also switched from traditional thin bike socks to smartwool bike socks that have extra padding on the sole which ended up working great. We decided to stay at a B and B only 11 miles from the race course. They allowed dogs so Moose came along too. Saturday we drove up to Greenfield NH, just north of Monadnock. Registration was from 2 to 9pm and we arrived around 4pm or so. Registering was fairly uneventful and I was pleasantly surprised to get a fantastic navy blue event t-shirt, a beer glass with the Hampshire 100 logo, and a full goody bag. Nice! We headed over to the B and B to settle in, the view was fantastic but the bed was a brick, and no a/c. I settled in and started getting my race gear together and Michael wandered off in search of some light snacks as we ate a fairly large late lunch. We snacked on sharp cheddar cheese and apple slices (and Tostitos!) when he got back. I brought both ear plugs and noise cancelling headphones to ensure a good night’s sleep and I slept great until 2:45am then patiently waited until 5am to get up and get ready. For anyone who is interested in what I used for water/nutrition/gear this is what I carried: REI Stoke 19 Women’s Hydration Pack with a 70 ounce bladder filled with water and Elete electrolyte supplement. One water bottle on the bike with Gatorade and Elete. In the Hydration pack waist and side pockets I brought 3 extra packets of Gatorade powder, 2 Honey Stinger Waffles, Gu Chomps, Honey Stinger Energy Chews, Clif Mojo Bar, and 2 Jet Blackberry Gu’s w/caffeine. Other than nutrition items I also carried an extra pair of gloves, 1 tube, 3 Co2 cartridges, Tylenol, tire levers, chain tool, extra socks, 2 bandaids, phone, and a small pump. Out of all this stuff I consumed one Honey Stinger Waffle which I love but wouldn’t recommend eating it while riding as it crumbles in your hand forcing you to kind of just mash it in before it gets dropped on the ground (but it tastes great!). I also ate the Gu Chomps, the Honey Stinger Chews and half the Mojo Bar which was tough to get down. The Chomps and Chews went down much easier. I ate one of the Gu gels just before the race and the other one at mile 40 or so with 3 tylenol. Ok, on to the race. We arrived fairly early and I choked down a bagel with nutella on the way to the race. I didn’t really feel like eating but knew that I had to anyway. After 3 or 4 bathroom runs I felt ready to spin around a bit on the bike to warm up. The temperature was high 50’s low 60’s and fairly comfortable. As I was getting ready to head to the racers meeting at 6:15am another rider approached me. She (Emmy) remembered me from racing in the Root 66 series about 6 or 7 years ago. Excellent! Besides Michael I didn’t know anyone at the race so it was great to have someone to talk to. She was in my class too and shared some advice and experience as she had participated in races of this length and also some 100 milers. We headed over to the meeting and I joined Michael at one of the picnic tables. A few minutes later Mike Wonderly stopped by to say Hi and Good luck. I had no idea he had entered the race so now I knew 2 people that were racing, even better! I missed most of the race meeting as I was either talking or my mind was wandering so before I knew it I was lined up next to Emmy and we tried to figure out just who was in our bracket. Boom, the pro’s are off and we are in the next wave. Boom, we are off, woohoo!!!! We circle the field and oops, track stand as everyone tries to enter the single track at once. The single track only lasts a minute then it is pretty flat fire road for a while. I decided to try to stay with Emmy as she had experience pacing for a longer race so we stuck together for a while. There were 4 women in expert veteran (my group), 4 in expert senior (the younger ladies), and 2 pros. The pros went off in the first wave and were long gone before we started. The first 20 miles or so was mostly fire road and mostly flat too with very brief sections of single track mixed in. The pace was fast and after one of the single track sections I noticed that Emmy had dropped back a bit and I thought I might actually be in the lead but wasn’t 100% positive. After arriving at Crotchett Mountain I was cranking down the ski mountain with another rider when we got flagged to slow down and I noticed a rider down on the side of the trail. How awful. Later I learned that he had a pretty bad injury but has since had surgery and is home recovering. At the bottom of the mountain I caught up with another girl that I didn’t recognize and she told me that she would let me go ahead in the technical section which confused me because I was pretty sure I had never seen her before but then I never saw her again after I entered the single track. Later I would realize it was one of the two pro riders. A sneaking suspicion that I was leading my class and that I might actually win crossed my mind and buoyed my already spiked adrenalin. One of my favorite parts of the race was a really long stretch of flat dirt road toward the end of the 20 miles. Some of the sport men were starting to catch up to me and when I turned around there were 5 or 6 of them drafting behind me which I thought was pretty strange, that has never happened at any mountain bike race I had been to before! The 40 to 50 stretch was tough but the 50 to 60 stretch seemed to last FOREVER! Lots of climbing and much more single track. I briefly stopped at the 50 mile rest stop for a piece of watermelon and decided to skip all the other aid stations and just ride non-stop to the finish line. There were mileage signs on the trees and I remember about a dozen marking the slow, hilly, techy, single track for mile 59. It was definitely the longest mile EVER. Michael found me at 3 or 4 road crossings over the last 10 miles and he and the dog were cheering me on. Up until about the 50 to 55 mile mark there were always other riders around to talk to, to commiserate with and to just suffer companionably with but from about the 55 mile point until the end I only saw one other rider so I was very happy to have my own little cheering section. The last couple miles were definitely the hardest. The singletrack was one climb after another and technical and I was pretty tired at that point. At the beginning of the race I was wishing for more single track but at the end of the race I was only wishing for flat fire road!